Export all Outlook Emails, Contacts, Calendars, Tasks, Journals to NSF. Outlook & IBM Notes must be installed to run PST to NSF converter. Various Date Filters are available each for Email, Calendar and Task. If you are using Outlook email client and currently wishing to switch to IBM notes, get Outlook to Notes migration software as a right solution. Try the FREE demo to evaluate the efficiency of the software. Demo version of PST to NSF export software, it can convert 15 items of emails, contacts, calendar, journals, notes, tasks to Lotus Notes for free. Free PST to NSF converter will give you a feel of how Outlook to Notes migration tool works. Import from Office 365 to NSF: If you have backup of Office 365 and you want to import data from Office 365 to IBM Notes, firstly export cloud mailboxes to PST and then use PST to NSF converter to migrate to Outlook to Notes. Automatic check for Prerequisite: After downloading the tool, when you push it to run, the built-in feature of the tool will automatically check for all the requirements to perform the conversion in a proper way. Extract All Outlook Items to Notes: NSF to PST conversion software allows the end user to select their preferred categories to move various Outlook items to Lotus Notes NSF format. 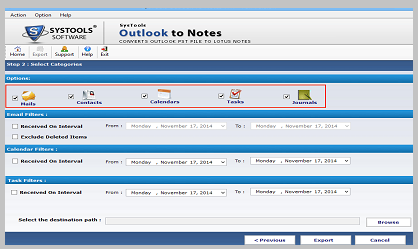 Outlook items that can be extracted as Notes are: Mails, Contacts, Calendars, Tasks and Journals. 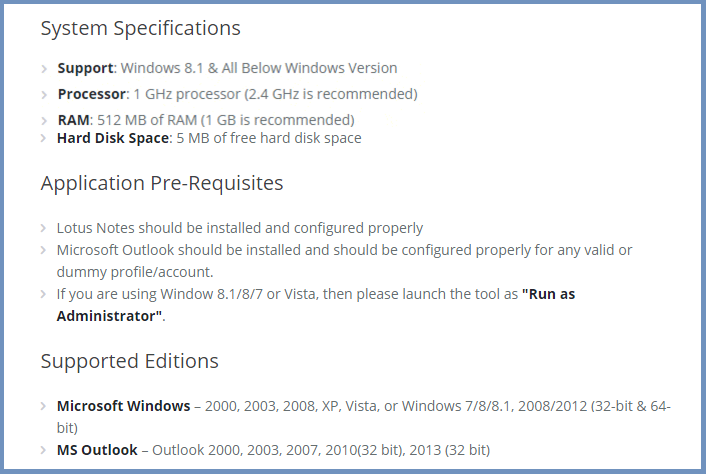 Various Filter Option: After you have chosen the items available in Outlook file for migration into NSF, the next step is to apply the filters. This is another feature of the software by which an end user can apply the filter on Email, Calendar and Task. Received on Interval: This option under Filter feature will work for the selected items only (say, if you have applied filter for email then it will be applicable to email only). So only those items will migrated into NSF, which are available in the selected date range between "From" and "To". Exclude Deleted Items: While applying Filter on Mail, the software gives an added feature i.e, to include or exclude deleted items. So, if you would not like to keep the deleted items after conversion from NSF to PST, choose the option "Exclude Deleted Items". Export multiple PST to NSF: Yes, you can export number of PST files in Outlook to NSF file in IBM Notes, all you need to do is to select all the files that you want to convert and proceed for migration. Keeping Status Report: After conversion process is completed, the PST to Notes converter generates a status report of exportation of Outlook file to NSF, the generated status can also be saved to the desired location for keeping the and see the status, next time when you need to perform conversion. With the free trial by the tool, user can see the software that how it perform. the demo edition of Outlook to Notes is FREE! The users are recommended to try out the trial version of the software, also known as the free PST to NSF converter. With this demo version, user can load 15 items per mail folder, that too for free of cost. Users with larger size of PST files also in multiple numbers can go for this edition. With the help of full software version, you can transfer emails, contacts, calendar, tasks, notes & all Outlook folders successfully in Lotus Notes. How to resolve errors receiving while prerequisites check on starting of software? Pre-requisites check automatically ensure that whether or not all the parameters matching the software requirements. If not, the they return an error. To overcome this, make sure that IBM notes is installed & configured properly in your PC and you have access from admin panel login. Try to register nlsxbe.dll. Make sure that Lotus notes is disconnected from Domino server. Does the software convert attachments too? Yes, Outlook to IBM Notes converter will export all emails along with attachments in it. Which versions of Lotus Notes does the software support? Outlook to IBM Notes software support IBM Notes 9.0, 8.5, 7.0 and 6.5. Can this software convert all emails except those are deleted? Yes, Outlook to IBM Notes migration tool will only extract those emails and other items that are not deleted. To do this, you will require to select “Exclude Deleted items” option in the software UI while conversion.